The Soviet Union was a country of many nations with over 100 different ethnic groups calling the former empire their home. That multi-national empire was reflected in the makeup of the Soviet Vysshaya Liga. Although very non-Soviet citizens played in the Soviet Vysshaya Liga, it was, therefore, still a very multinational league. In fact, in some ways, it was the most exotic league under the umbrella of the European football governing body UEFA. Described as a Champions League of sorts within the Soviet Union the only Soviet Republics that were never represented in the Soviet top flight were the Turkmen SSR and the Kyrgyz SSR. Thirteen different Soviet Republics were represented in the Soviet Vysshaya Liga. In this article, we explore the five most exotic clubs that have played in the Soviet top league. We start our journey with a trip to Georgia. Based in Georgia’s second largest city Torpedo was founded amidst the wave of club expansion that the Soviet Union experienced following World War II. With the country being rebuild after the devastation suffered during, what is known in the Soviet Union, the Great Patriotic War many secondary cities in the USSR received the funding for stadium projects. As a result, they were also able to support and maintain football clubs playing in either the first or second flight of Soviet football. In 1945 construction began on the Kutaisi Auto Mechanical Plant. With the establishment of the factory, the city also received the funding to build a new football-specific stadium. Now known as the Ramaz Shengelia Stadium, named after the prolific Georgian playmaker, who started his career in Kutaisi before becoming a superstar at Dinamo Tbilisi. Altogether Torpedo Kutaisi played 13 seasons in the Soviet Vysshaya Liga, the second most among all clubs hailing from Georgia, behind the Soviet giant Dinamo Tbilisi. The club’s best finish in the Soviet Vysshaya Liga was an 11th-place finish in the 1985 season. The club has been relatively successful and in 2000, 2001 and 2017. The club also won four Georgian Cups in 1999, 2001, 2016 and 2018. 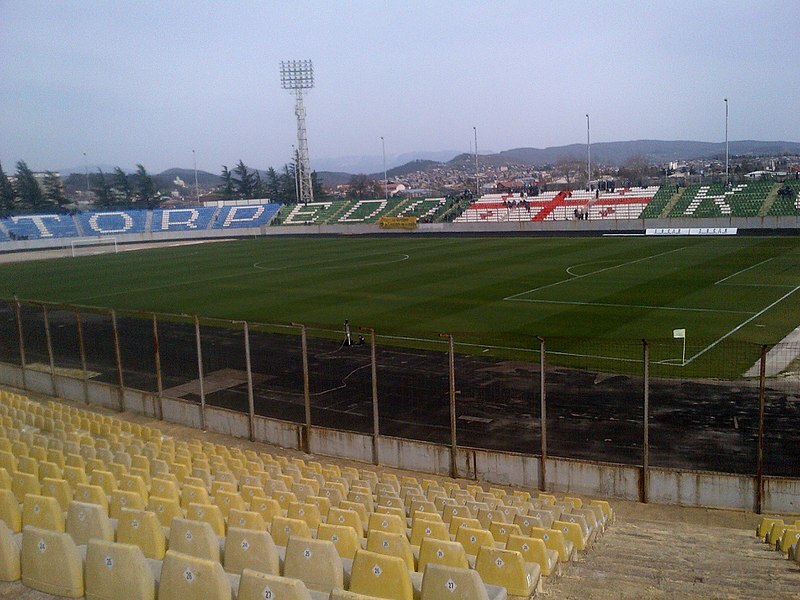 This year Torpedo became close to reaching the UEFA Europa League group stage but ultimately were eliminated by Ludogorets Razgrad in the playoffs. Ararat Yerevan is another club that has been a bit in the shadow of Dinamo Tbilisi. 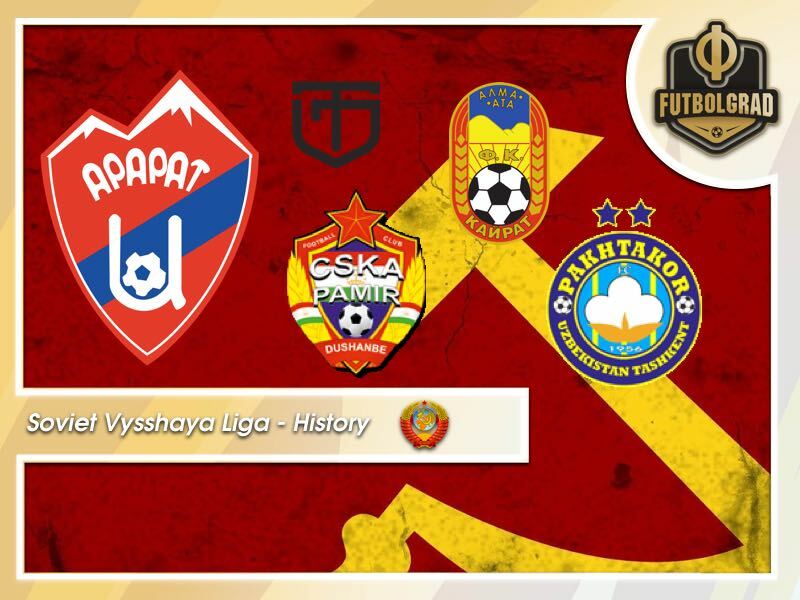 The biggest club of the Armenian SSR Ararat Yerevan was the only other club from the Caucasus, other then Tbilisi, to win the Soviet Vysshaya Liga. Led by the legendary Nikita Simonyan, the club dominated the league that season. At Ararat, Simonyan built a team that included the likes of Eduard Markarov, Alyosha Abramyan, Aleksandr Kovalenko, Oganes Sanasanyan, Levon Ishtoyan, Arkadi Andreasyan and Norair Mesropyan. Simonyan would leave the club the following season and was replaced by Viktor Maslov. Under Maslov Ararat Yerevan advanced to the quarterfinals of the European Cup, where they were eliminated by Bayern München. The 1970s were the most prolific period for the club. 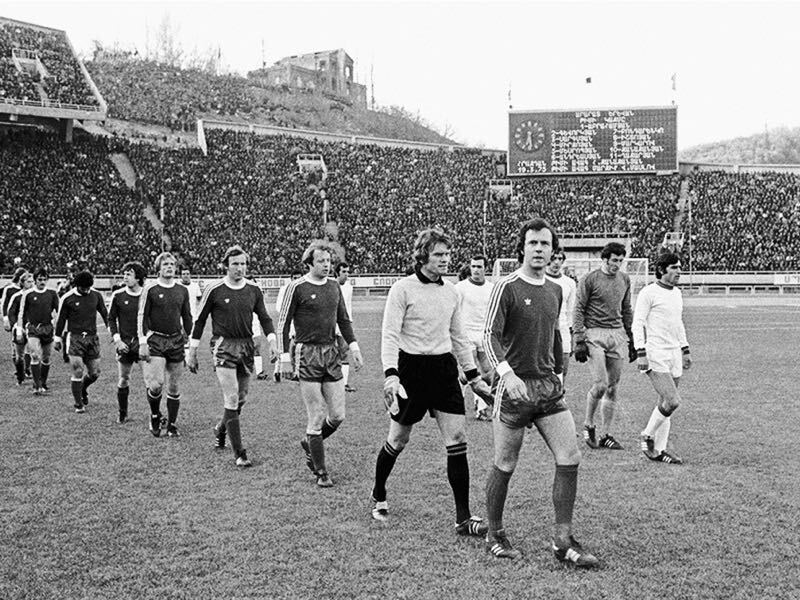 By the 1980s Dinamo Tbilisi overshadowed the Yerevan based side by winning the UEFA Cup Winners’ Cup in 1981. Then with the collapse of the Soviet Union Ararat further lost importance and have won the Armenian national championship just once in 1993. From the Caucasus, our journey takes us to Central Asia. Known as the cotton growers, Pakhtakor were the biggest club in Central Asia during the time of the Soviet Union. They were also one of the few teams in the Soviet Union that had a foreigner under contract. the Greek player Vasilis Hatzipanagis, whose parents were communists who had fled Greece after the failed communist revolution in 1949. Hatzipanagis was born in Tashkent and played for Pakhtakor between 1972 and 1975, and also made an appearance for the junior Soviet national football team. Technically only Soviet citizens were allowed to play in the Soviet Vysshaia Liga, and for this reason, Hatzipanagis became a Soviet citizen. In 1975 he left the Soviet Union to play in Greece and also became a Greek national team player. 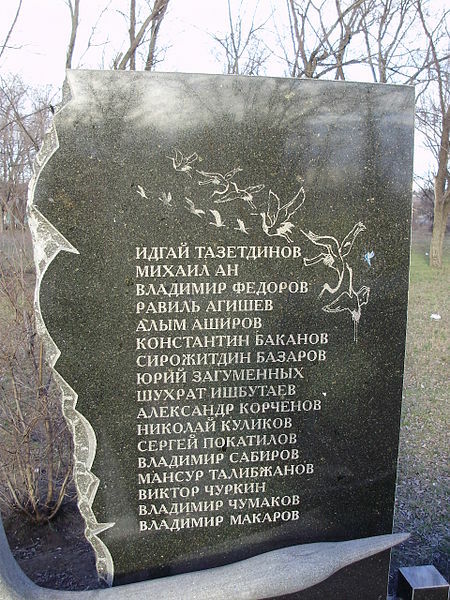 Four years later tragedy struck Pakhtakor. Flying to Belarus to meet Dinamo Minsk Pakhtakor’s plane was involved in a mid-air collision over Dinprodzerzhynsk, Ukraine, and all 178 people aboard the two planes died. Pakhtakor lost 17 players and staff members in the crash. Within three years of the disaster, Pakhtakor had recovered, however, finishing sixth in the 1982 Soviet Vysshaya Liga, the club’s best ever finish. Since independence Pakhtakor have won the Uzbek League eleven times but were briefly challenged by the emergence of Bunyodkor, which was lavishly funded by the government, these days Lokomotiv Tashkent are their biggest rivals, but Pakhtakor’s history means that they would be admitted to the league over their city rivals. Today known as Kairat Almaty the club represented the capital of the Kazakh ASSR. Located in the very South-East of Kazakhstan right on the border to Kyrgyzstan and relatively close to China the Kazakh government moved the capital from what is now known as Almaty to Astana in 1997. But back in the USSR Alma-Ata was not only one of the most important cities in Central Asia but also the home to the most consistent Central Asian club in the Soviet Vysshaya Liga. Kairat are ranked 14th in the all-time standings of the Soviet Vysshaya Liga, one position ahead of the second most successful club from Central Asia, Pahkhtakor. Known as the nation’s team, Kairat was founded as Lokomotiv Alma-Ata in 1954 amidst the post-World War II club boom that took place in the Soviet Union. In 1956 the club was renamed Kairat (power) and were put under the wing of the Republican Rural Voluntary Sports Society. The origin as a railway team, however, allowed the club to compete in the European Railworks Cup, which they won in 1971 defeating Rapid Bucharest, another club with a rail workers connection, 2-1. That year was one of the club’s most successful years as the club also finished eighth in the Soviet Vysshaya Liga. It was the club’s only title until 1988 when Kairat won the USSR Federations Cup. Similar to the League Cup in England the Soviet Federations Cup was established in 1986 and only featured clubs from the Soviet Vysshaya Liga. Following the collapse of the Soviet Union Kazakhstan was a member of the Asian Football Confederation until 2002. During that time Kairat took part in the Asian Cup Winners’ Cup twice in 1997/98 and 2000/01. In 2001 they reached the quarterfinals of that competition where they were eliminated by the Iranian side Esteghlal. In 1992 and 2004 the club won the Kazakh Premier League and also have won the Kazakh Cup on nine different occasions. Nonetheless, the club has never reached the group stage of a European competition and has been in general overshadowed by FC Astana, which receives lavish government funding. Pamir Dushanbe’s footprint on the Soviet Vysshaya Liga is rather small. The club only played three seasons in the Soviet top flight. It is perhaps the biggest tragedy of Pamir Dushanbe’s history that the club did not manage promotion to the top flight of the Soviet Union until 1988 when the Soviet Union was nearing the end of its existence. It would be wrong to assume that Pamir Dushanbe was promoted merely because of a decline of the league. In fact, Soviet football was at its strongest towards the end of the 1980s. Ranked second in the UEFA co-efficient standing, just behind the Serie A, the Soviet Vysshaya Liga was, in fact, a top league in European football. 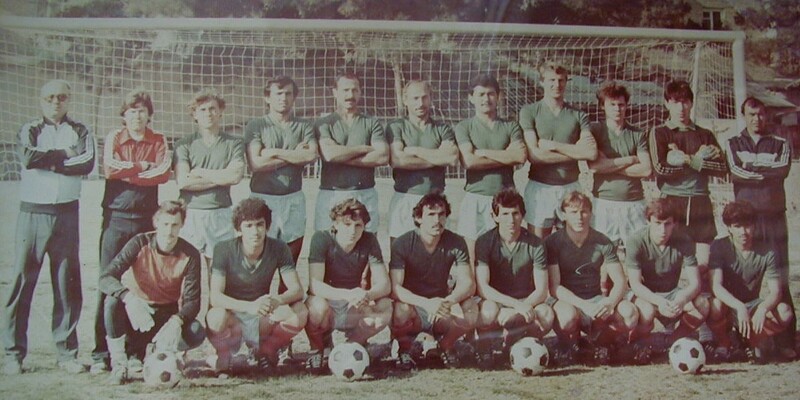 The 1988 Pamir Dushanbe side that managed promotion to the Soviet Vysshaya Liga. Attached to the military, officially the club was known as SKA Pamir Dushanbe, the club was able to do things a bit different than the other teams in the Soviet Vysshaya Liga. For the most part, foreign players were not allowed to play in the Soviet league pyramid, but Pamir Dushanbe being a bit outside of the spotlight was able to use its army contacts to bring in Derby Mankinka, Wisdom Chansa and Richard Mwanza from Zambia—the three players would sadly parish in an air crash. The trio only played a handful of games in the USSR and left shortly after that, but they were the first foreign players signed from abroad to play in the Soviet Vysshaia Liga. Pamir Dushanbe being able to sign foreigners and playing them in the Soviet Vysshaya Liga added to the already exotic status of the first ever-Tajik club to play in the Soviet top flight. Finishing 13thin their first league the club surprisingly avoided relegation to the Soviet Pervaya Liga (first division). Times were, however, changing in the Soviet Union. Ahead of the 1990 season, Dinamo Tbilisi had withdrawn from the Soviet Vysshaya Liga to play in the newly created Georgian top flight, and within four games of the 1990 season, Žalgiris Vilnius also exited Soviet football. The season would, therefore, finish with 13 teams in which Pamir finished in the tenth spot. But it was also in that year Dushanbe had their biggest result in the top flight beating the mighty Spartak Moscow 5-1 in Dushanbe. Nowadays known as CSKA Pamir Dushanbe the club remains a military club, which, however, has not translated into massive resources. Instead, the club has only won one title since independence and has been surpassed by other clubs in the country.